Spring is finally here which means it's recital season. Joining us on The Learning Lab blog series today is Jennifer Walschap, Director of Imagine Music and Arts, a wonderful arts education school in Oklahoma City. 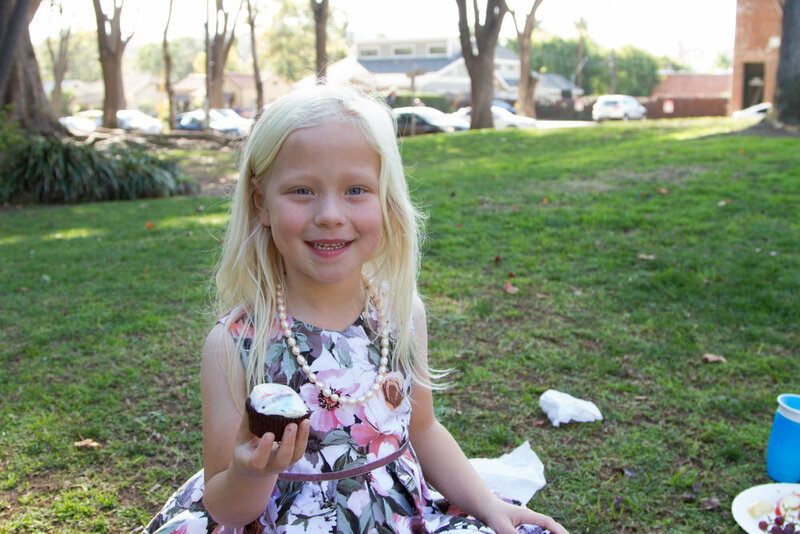 Ellen, 6, enjoying a cupcake after a performance. Celebrating after performing is a wonderful way to assure students that yes, all of the hard work really does pay off! Preparing for recitals should be a careful and mindful task for both students and teachers. It is important to set students up for success so that they will have a positive performance experience and in turn be motivated to continue their music study. Parents will appreciate hearing their child’s polished performance and feel encouraged that their hard work (and sometimes struggles) are paying off. Much can be done in private lessons in the weeks leading up to recitals. I usually have my students switch to “Performance Mode,” where they visualize themselves at the recital and go through the performance, complete with bows. We address performance anxiety issues, and secure our memory spots so that students do not have to stop playing or return to the beginning of the piece if they make a mistake. Name Game - we play some sort of rhythmic, fun game to learn each other's names and get comfortable with one another. Bowing Contest - we remind ourselves how to bow properly (feet together or slightly spread apart, hands to our side, smile and say “Are my shoes tied? Yes they are!). We then do a contest for the best bow and then the silliest bow. Peer Critique - I ask the students to call out common things that make a good performance and write them on a whiteboard. This can be: good dynamics, phrasing, correct rhythms, keep going, steady tempo, good hand position, good bow, great posture, articulation, interpretation, etc. Students take turns performing and then their peers give them comments. Each unique comment gets a sticker on their hand and the person with the most stickers at the end of class gets a prize. Recital Details - we go over what to wear, where to be and when, what kind of snack to bring, etc. This is helpful because the parents are usually sitting there watching as well. I’ve seen big results since I started holding regular Performance Classes. These are our dress rehearsals, and students who attend walk up to the piano on recital day with confidence and joy as they perform a well-polished piece. “Mess-ups” are no big deal, as they have practiced how to pick up and keep going with poise. As a teacher, I can enjoy the recital without worrying that anyone will fall apart or give a mediocre performance. I would definitely suggest some type of group activity for teachers wanting to better prepare their students for upcoming spring recitals! be creative: I’ve given my students a vaccuum cleaner before and even once had Leika (the ‘real’ Musical Husky) howl along! After enduring the distraction testing, students are much better prepared for anything that could spring up in the recital. But even more significantly, this game helps correlate performances with FUN. My students LOVE distraction testing and look forward to it all semester. Anything we can do as teachers to associate performing with positivity is pedagogically-sound.